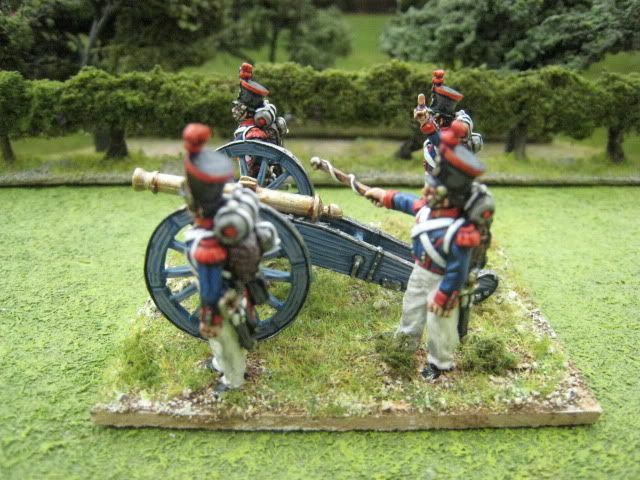 I painted a couple of Carlist guns recently to give the rebels a bit of firepower. 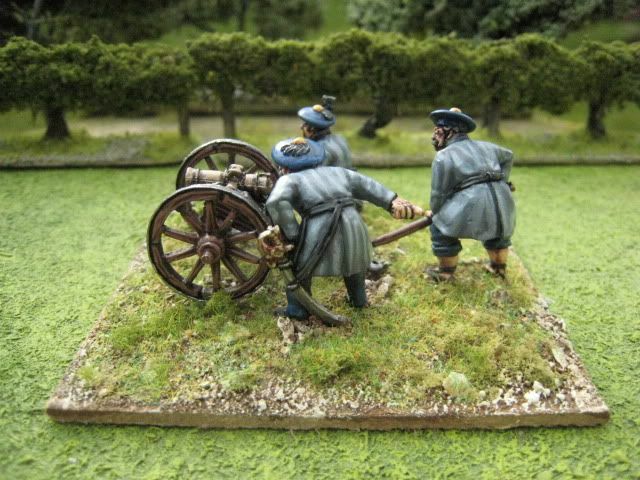 This is the first set, a 3-pounder mountain gun. 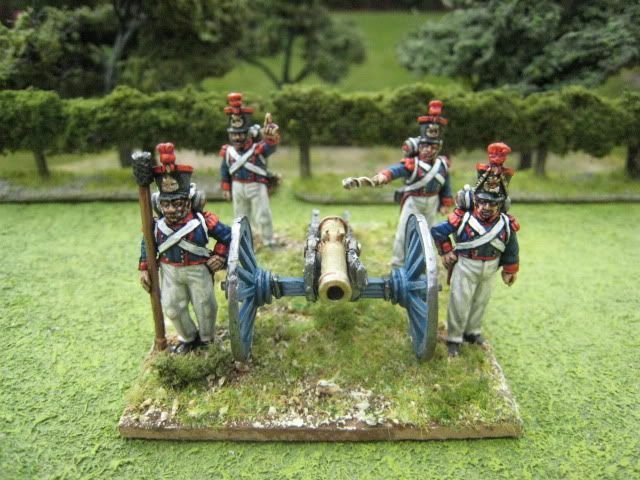 As I noted in the previous post, the Carlists' artillery arm was inferior to that of the Isabelinos. 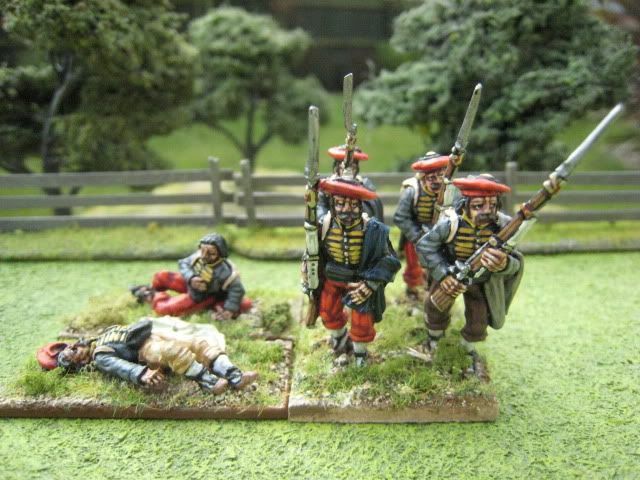 The Carlists relied upon captured pieces and guns that they could eventually cast themselves. There are a couple of conflicting references for the uniform, and I chose to go with grey frock-coats and blue berets. The grey I used for the frock-coats is a new Foundry palette (for me, at any rate), "Rebel Grey 118". Out of the two greys in the Foundry ACW paint set, "Rebel Grey" is a proper "grey", whereas "Confederate Grey 117" comes out with a distinctly blue tinge. That's not a problem for FCW painting, as I intend to use "Confederate Grey" for the French Foreign Legion's overcoats. For the mule, I used Foundry "Quagmire 63" to create a grey dun. Vines in the middle background are from Murray Bridge Trees & Terrain. Not much else to say, really! 4 figures and a mule. Painted January 2012. 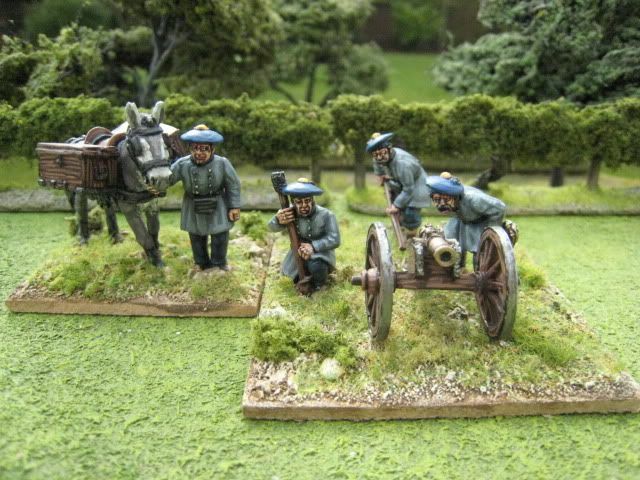 This is the Perry Miniatures Isabelino foot artillery pack. The Isabelino side in the First Carlist War had the benefit of the army's regular artillery units. 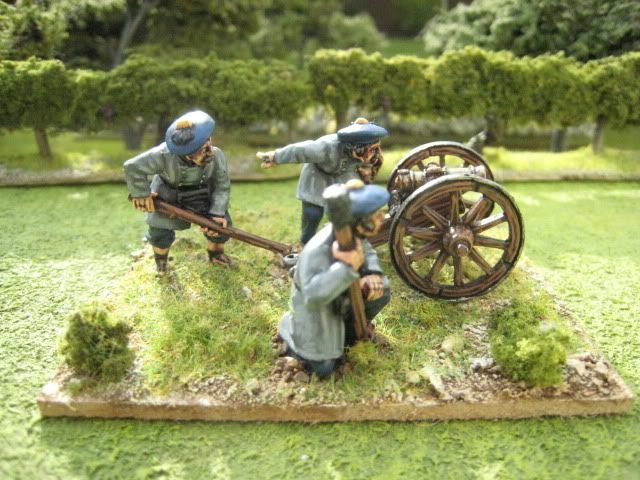 The Carlists had to build their artillery capability from scratch. Neither side seems to have deployed artillery in large numbers, at least outside of sieges. 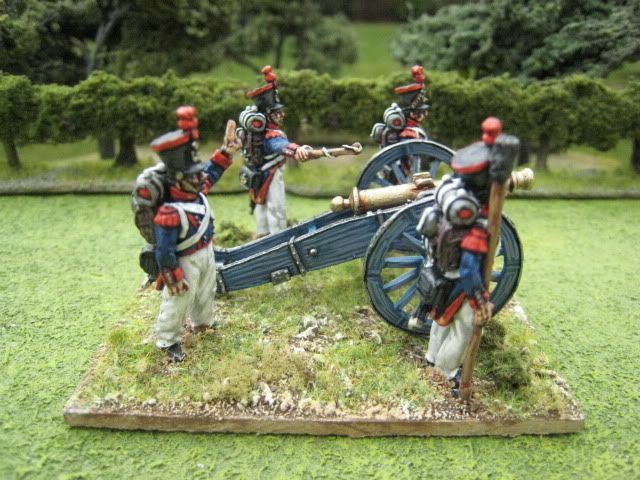 I expect I'll add to this pack by painting a couple of others, but that's probably all I will need given the mountain gun packs and BAL artillery I have already completed. The uniform is the standard "turqui" blue tunic and white summer trousers. The Cairns/Perry book has artillerymen in turqui trousers but I decided to follow El Mercenario on the Perry website by putting the men in white trousers. The gun was painted with the Foundry "British Blue Grey 75" palette. PS My problems with photobucket and vanishing photos are now hopefully at an end, and my "Pro" subscription will run for another 2 years. In summary, I couldn't renew my subscription until my existing automatic renewal was cancelled, and that was something photobucket had to action themselves. Anyway, all seems resolved so I'm looking forward to lots of blogging in the next few weeks. 4 figures. Painted December 2011. 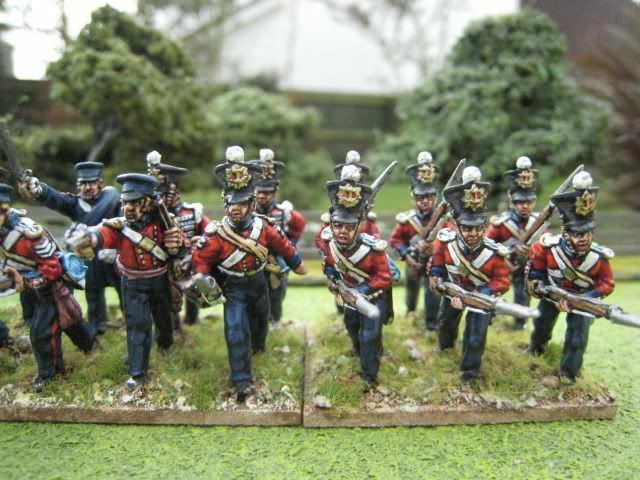 The Royal Marines were, with the Royal Artillery and Royal Marines Artillery, the only British regulars who were involved in the First Carlist War. Royal Navy transport ships were used to ferry around troops of the volunteer BAL and the British government gave permission to the British naval commander in the area, Lord John Hay, to take measures to protect ports under Isabelino control and then provide assistance to recover those ports which the Carlists had seized. The Royal Navy's support of the BAM and the Isabelino cause involved the provision of off-shore artillery and the participation of Royal Marine detachments in some of the land fighting. The Marines appear to have first fought in small detachments but eventually a full battalion was landed which took part in the battle of Oriamendi in March 1837. At that battle, the BAL was pushed back by a large Carlist army and suffered heavy loss. The British press, ever keen to emphasise the role of the British regular troops, praised the Royal Marines for covering the retreat of the BAL. However, Sergeant Alexander Somerville of the 8th Regiment, recalled that the Marines fought a steady, but cautious, fight until they were withdrawn by Lord Hay on the basis that the Marines were exceeding their remit by becoming too involved in a pitched battle. There appear to be conflicting account of how the Marines performed; whether they were, in fact the rearguard saviours of the BAL or withdrew from the action prematurely. Apparently at full strength the Royal Marines battalion deployed in the FCW was around 800 men, which means an 18-figure unit for my scale of 1:30 (or thereabouts). 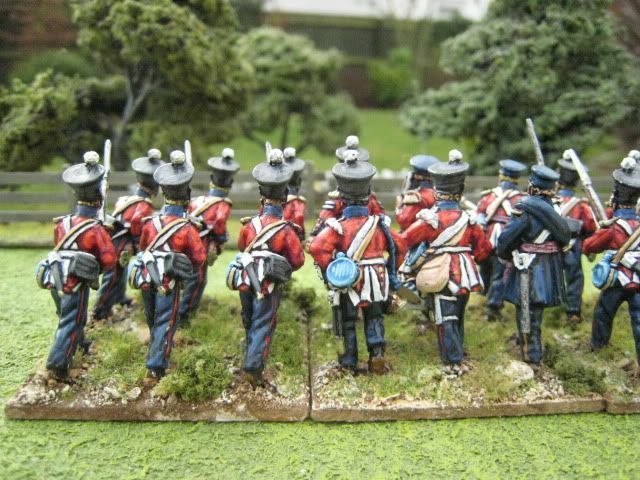 I particularly like the dynamic poses of the command figures in these Perry Miniatures packs. 18 figures. Painted October - December 2011. I'm afraid that I've had a serious loss of wargaming "mojo" of late, hence the silence here since January. I'm sorry about that. In addition to this blog I have found myself staying away from many other blogs and fora which I regularly visit, so apologies to all those who have made interesting posts over the past few weeks which I have failed to notice and comment upon. There is no "story" behind this, just too little time and too many demands on that time. Anyway, I have been painting in the meantime and, more importantly, had a day of work last week that co-incided with a rare appearance of the sun in Essex so enabling me to take photos of everything I've painted since last December. I now have enough material for 6 painting posts and a couple on other military things, and other units are close to being finished. So I'll be able to make weekly posts for the forseeable future. I've been making an effort recently to finish off items that have been sitting on my painting table in various stages of completeness. 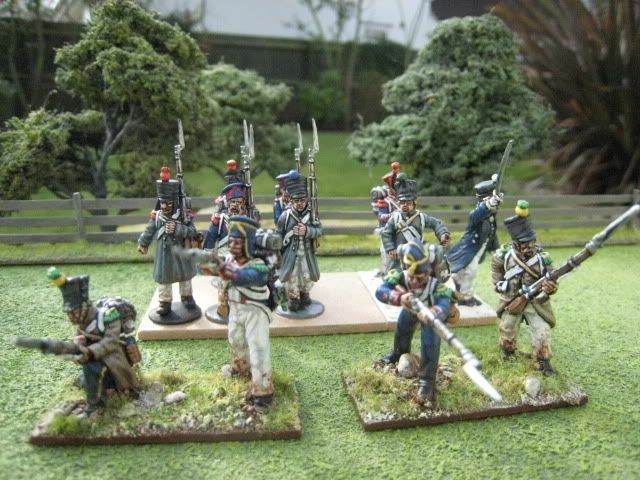 These items include ECW command stands, more Darkest Africa Baluchis/Arabs and my first completed ACW Confederate units. Nothing to do with the AWI, I know, but I'll post photos anyway. 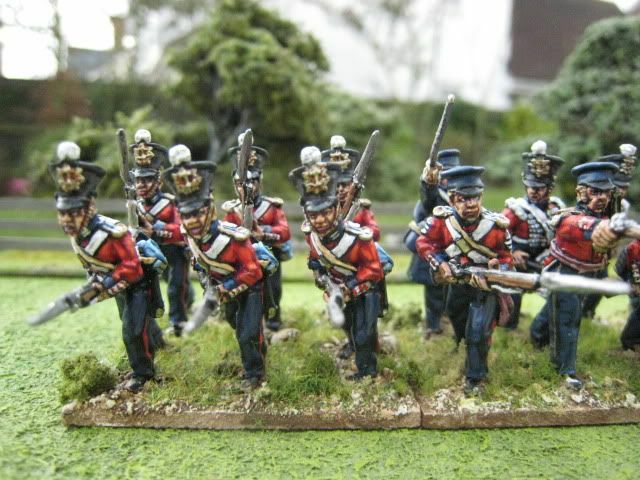 Talking about the AWI, I'm afraid everything I've been working on recently is for my First Carlist War and 1815 projects. 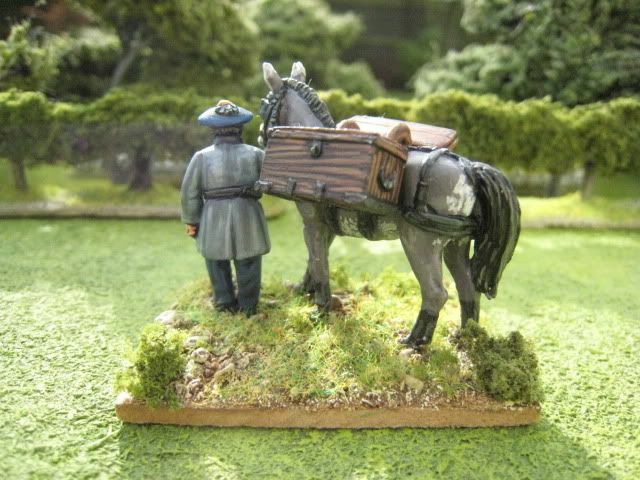 I want to finish off some larger FCW regiments this month, but in April I'm very much intending to revisit the AWI and work on more American cavalry and French. But to be honest, given the size of my AWI collection (I must add it all up one day), there is not much impetus to add to the American and British collections (cavalry aside - I still have some obvious gaps on that front), at least until Perry Miniatures release their plastic sets, at which point I expect I will jump back into the period for a good while. Above are a couple of wip shots - on the left are Navarre Guides for the FCW and on the right are the beginnings of the French 54th Line at Waterloo. The former I am progressing at the moment; the latter was begun as they were the only undercoated figures I had when I'd finished something else! I'm not sure when I will get around to finishing the battalion. 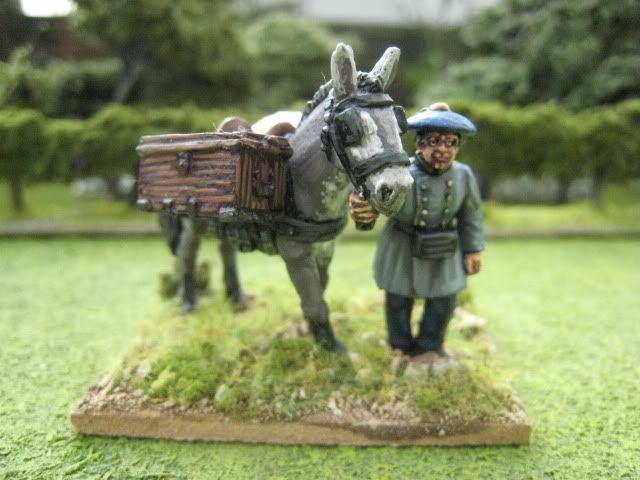 On the ACW front, I have two Reb regiments finished and another pair in variouos stages of completeness. 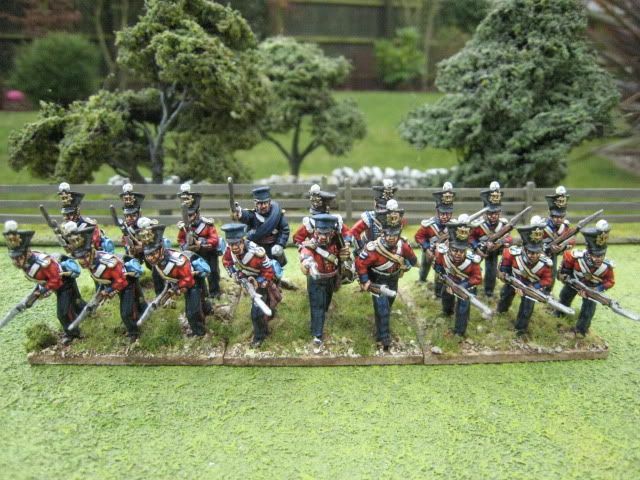 These are mainly figures I painted about 12 years and simply failed to base, so they are painted in a style that is quite different to the one I use today (and the figures are Dixon so I know a lot of readers won't like them!). 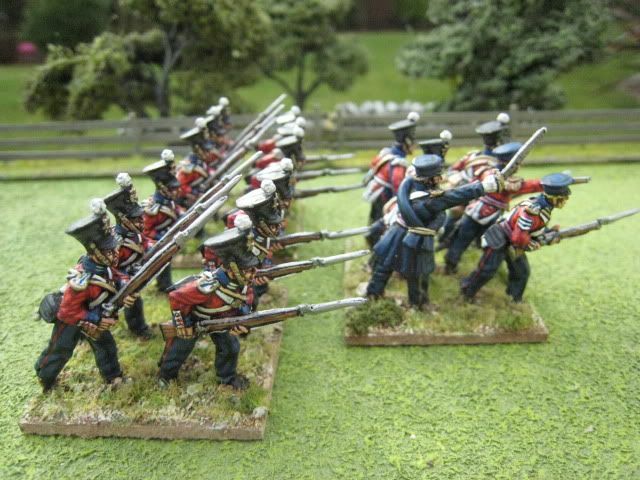 I've been adding some more figures over the past 12 months and what I'm intending to do is wait until the other 2 units, and a couple of vignettes, are finished and then have an "ACW week" along the lines of the "New Zealand Wars week" of last year. I'm aware that I need to return to the South American Wars of Liberation at some stage too, and paint more ECW because Eclaireur wants to have some games with all the figures he's painted!